Recently I had the chance to go to experience the epic “reunification” train journey to Saigon from Hanoi. Now travellers often take this journey by an easy 2 hour flight, however I would like to take this as an opportunity to experience a unique experience in Vietnam Travel, to witness the stunning landscape from throughout the vertical length of my magnificent country, as well as to interact with those whom I meet on the train journey. The trip started in the Hanoi Train Station at 7.pm. I accommodated the second berth in a sleeper chamber with one Vietnamese family and another foreigner. As the train slowly crawled its way out of the small alleys where residents are almost next to my window, six of us introduced ourselves, of course, I was the interpreter. The family kindly shared their foods with us. The kids were very excited to talk with the foreigner as they had the chance to practice their English at school. The first night didn’t last long as we were a bit tired and I didn’t want to wake up the sleeping kids. The morning welcomed us with a glorious sunrise somewhere in Quang Binh Province. 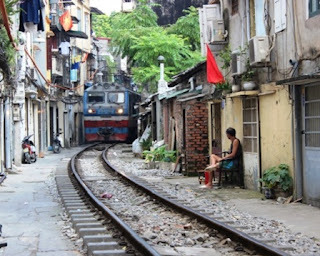 The Central Region of Vietnam was still so poor, the houses by the track mostly do not have the second floor and very small. But an interesting thing was although it seemed like no one was at home, many doors were left open. I guessed that living in a same village here is like living in a same big family, where people are kind and sincere and trusting each others. We reached Hue at noon. I went down the train to buy some local delicacies and to have a Bun Bo Hue (or Hue Beef Noodles). I had to be quick because the train didn’t stop for long. Then on we went through the most exciting and famous part of the trip, the one that traverses Hai Van Pass. The train went very slow as the track was up and down and curvy. I could even see the end of the train looking through the window. The landscape was just magnificent. 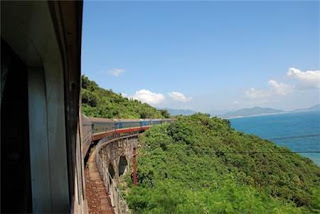 Sometimes, the track was so close to the sea then suddenly it went straight into a dark tunnel then another spectacular view at the other end. My new foreigner friend was able to capture some beautiful photos for his own travel blog. He said he was truly mesmerized by it, and for sure he was not the only one feeling so. We said goodbye to the family when we reached Danang but the empty berths were replaced by 2 other Japanese travelers and a young Vietnamese couple. We all spoke English so we shared lots of funs and stories in the remainder of the journey. That evening we stayed up until midnight so had the chance to experience more the train after dark, when vendors passing by chambers to sell foods and drinks. I found out that some people also bribed the train security officer to sleep in his own chamber because they didn’t have enough money. I guessed in 2016, there were only intrepid travelers and those who cannot afford a flight ticket took this long train journey. We got to Saigon not too long after the second sunrise thus ended a memorable train trip and a very special travel experience to me. This is something I highly recommend if you want to know a traditional and slow way of traveling in Vietnam.